Edwin Hawkins, a Grammy-award winning gospel singer and arranger, passed away this past January at the age of 74. He left behind an unmatched legacy, revolutionizing what it could mean to be a gospel artist. His crowning achievement was bringing his arrangement of “Oh Happy Day” – originally an 18th century hymn – to wide audiences. In the late 1960s, still a college student, Hawkins put together the new arrangement for the Northern California State Youth Choir. Hawkins and the choir’s intentions were to record an album to sell to local churchgoers to raise funds for a trip to a gospel competition. As fate would have it, the record found its way into the hands of some Bay Area underground rock DJ’s. They played the song and it spread like wildfire. 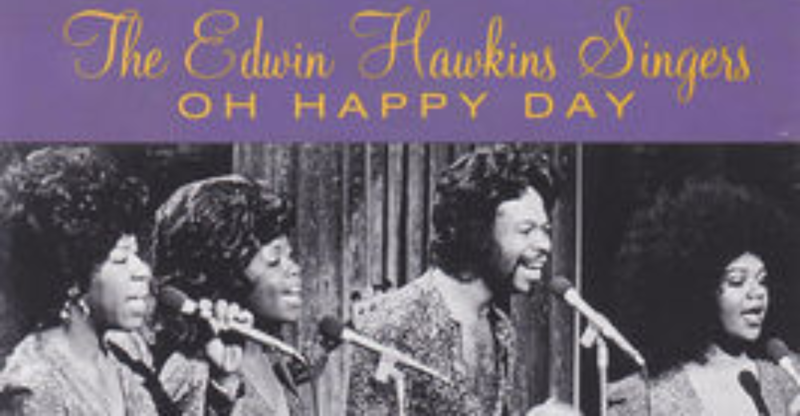 The re-named Edwin Hawkins’ Singers’ “Oh Happy Day” was the first gospel song to become a hit on the secular charts in 1967 when it was released. They also won a Grammy for “Best Soul Gospel Performance”. Hawkins’ use of contemporary sounds – a Latin groove, synthesizers, a soul-influenced lead vocal performance – created a new model for gospel music. It opened the door for artists like Aretha Franklin, The Winans, and Richard Smallwood to bring the Good News into the secular realm. “Oh Happy Day” has become a gospel standard. It’s been covered by hundreds of artists across genre boundaries. The history and legacy of “Oh Happy Day” is explored in this audio piece by Gospel Roots producer Alex Lewis featuring the voices of Edwin Hawkins, the song’s lead singer Dorothy Combs Morrison, producer Boo Mitchell, historians Joyce Jackson and Dr. Donald Dumpson, and more. Below, watch a performance of “Oh Happy Day” by the Edwin Hawkins Singers, and an amazing video of Dorothy Combs singing it at Big Sur, with Mimi Farina, Stephen Stills, and thousands of concert goers. This article and audio piece was written for WXPN’S GOSPEL ROOTS OF ROCK AND SOUL and produced by Alex Lewis.